We are a small family business based in West Yorkshire. 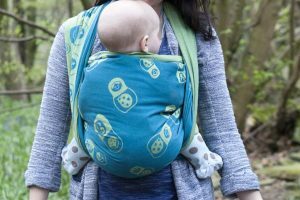 We produce beautiful, stylish and durable woven wraps and ring slings suitable to carry your baby from birth to pre-school. We are proud to be based in the weaving capital of the world: Huddersfield has a strong textile and weaving heritage and is home to some of the worlds best weaving mills, producing yarn and textiles for the worlds finest fashion houses and Royalty. All aspects of our slings, from yarn supply through to sewing is completed within a few miles of Shire HQ here in Huddersfield. 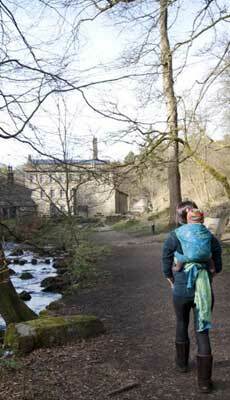 The concept for Shire slings was created by two Mothers in Huddersfield in 2010. Between them they have 8 children. With a sling library and a huge personal collection of woven wraps they realised something was missing and so began Shire slings. Our aim is to produce fabulous baby wraps from the finest natural materials, sourcing everything as locally as possible. 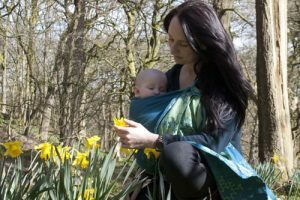 We produce woven wraps and ring slings that are both functional and stylish and just as easy to use for a beginner as a babywearing professional. Our wraps will stand the test of time and we hope you will still be using them with your grandchildren. Four years of dedication, research, development and exciting ideas later, we finally have a product that meets our exacting standards. It’s been a long and challenging journey. We know you will agree; that it’s been worth the wait… Our Logo Our Logo is a Dog Rose. A Rose for Yorkshire, Dog Roses were encouraged to grow wild during the middle ages and since due to their medicinal properties. They never fail to surprise with their elegant beauty and grace when you come across them on urban back streets or peeping out of the hedgerows.